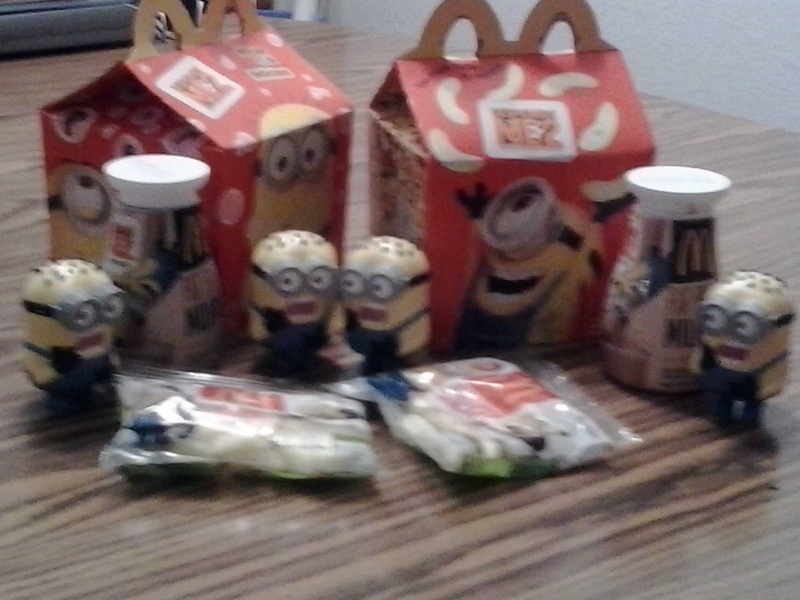 My name is Norma and I'm a Minion junkie. Ask anyone who knows me well, and they'll confirm it: I never really grew up. I collect stuffed animals--and I love animated films. 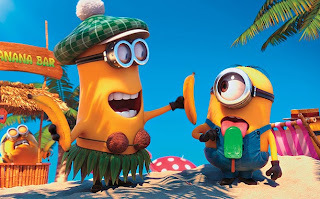 I admit that I've always preferred traditional animation, but then a bunch of noisy, yellow, overall-clad, goggle-wearing critters known as the Minions arrived on the movie scene, and it was love at first sight. In Despicable Me, they were the bickering followers of supervillain Gru (voiced by the always funny Steve Carell), who adopted three little girls as part of one of his evil plots. In Despicable Me 2, Gru, now a devoted dad, has reformed and is attempting to start a legitimate business. He's turned his lab into a high-tech kitchen for making jellies and jams. Too bad nobody, including the Minions, likes the stuff they're making. His longtime sidekick, Dr. Nefario (Russell Brand), grows restless--as restless as a hard-of-hearing geezer mad scientist can possibly be--and decides to leave Gru's lab and go back to evildoing with another supervillain. Gru reluctantly says goodbye to his soon-to-be-former accomplice and the Minions give Nefario a twenty-one fart gun salute (yep,I said fart gun--it wasn't a typo). When the Minions start to disappear, Gru doesn't notice--at first. He's busy deflecting the matchmaking attempts of an annoying neighbor and his own daughters. The youngest, Agnes, struggles with her role in a Mothers Day pageant at her school, feeling the lack of a mother of her own. Gru is also concerned that eldest daughter Margo (voiced by Miranda Cosgrove), now a teenager, has discovered boys. Enter Lucy Wilde (Kristen Wiig, who provided the voice of snarky orphanage director Miss Hattie in the original film), an agent for the Anti-Villains League, who kidnaps Gru and Minions Stuart and Dave and takes them to AVL headquarters, where AVL Director Silas Ramsbottom (Steve Coogan) tries to recruit Gru to help find a supervillain who possesses a dangerous formula that turns anyone injected with it into an unstoppable purple killing machine. He and Lucy end up partners, but at first they can't get along, and every attempt they make to find the supervillain ends badly...starting with a restaurant break-in, during which they run afoul of a chicken (sorry, I couldn't resist). When little Agnes declares that Gru loves Lucy, Gru not only denies it, he insists he doesn't even like Lucy. Typical male...denying his feelings right up to the moment he says "I do!" The AVL thinks they've found their man when wigmaker Floyd (Ken Jeong) is arrested. 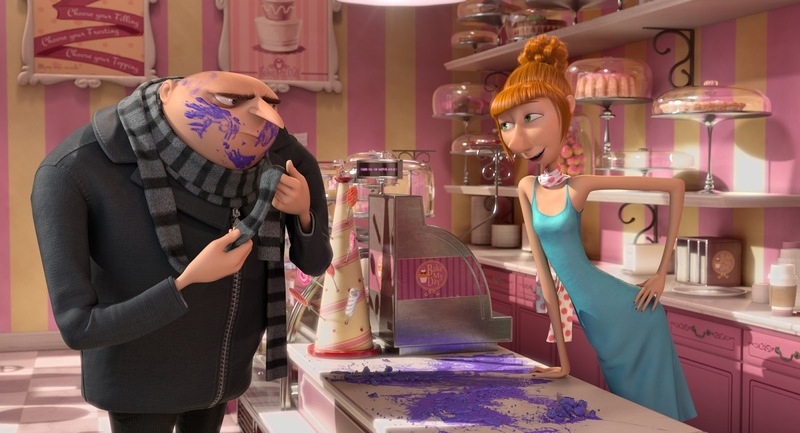 Gru is dismissed in spite of his insistence that restaurateur Eduardo (voiced by Benjamin Bratt) is the real culprit...and with Nefario's help is turning the Minions into monsters. By the time his suspicions are proven correct, Lucy is on a flight to Australia and her next assignment. Will Lucy return? Does Nefario's conscience get the better of him? 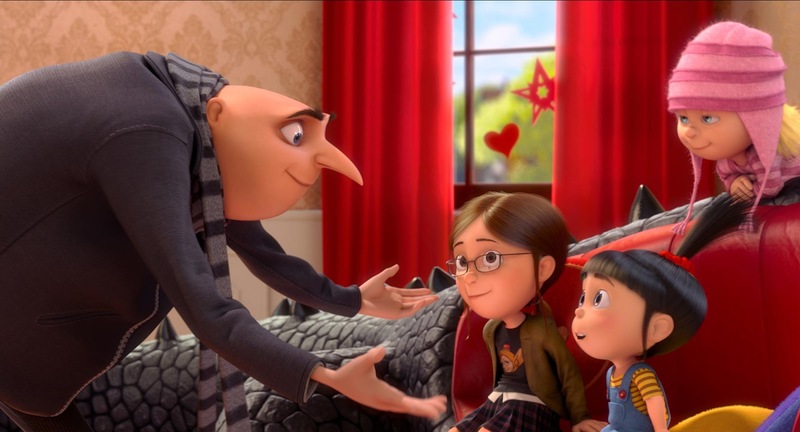 Do Gru and Lucy have a future together? Will Margo, Edith and Agnes finally get a mom? And what of the Minions? Will they be yellow and cute again in time for next year's Minion Movie? I had no idea I wanted to see any of these movies until right this minute. Thank you! Sounds awesome. You'll love them, TC. The Minions are adorable! Everyone should have pockets full of minions to do all the dirty work! LOL Great review. I hope to see this one day! But the Minions rarely do as they're told! I am a huge animation fan too. Sometimes they are the best movies out at any given time. I have wanted to see Despicable Me but never gotten around to it. I have adored the Minions every time I see them on TV though. I need to Netflix this movie. We must exchange photos of our stuffed animals. I have lots of Japanese characters. I just might have to go to McDonald and get a Happy Meal now. 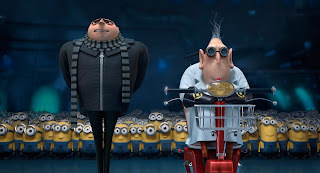 As for Despicable Me 2 it sound so fun I really want to see it now. Only problem for me is Russel Brand (especially because of the filthy prank calls he did on his radio show) so I will have a hard time watching. I rather not give him my money. Maybe this will be a movie I will have to watch when it comes to TV. What a great review. You and William write the best reviews. By the way I can't wait to see Pacific Rim ! It looks so good. I am so bummed Johnny Depp ruined The Lone Ranger. I was so looking forward to that movie. Our pastor said he's looking forward to The Lone Ranger because he enjoyed the TV series so much when he was a kid. I didn't have the heart to tell him this movie has thoroughly trashed the Lone Ranger! I love anything animated myself. But since Sweetman is OCD, I don't get to collect anything. 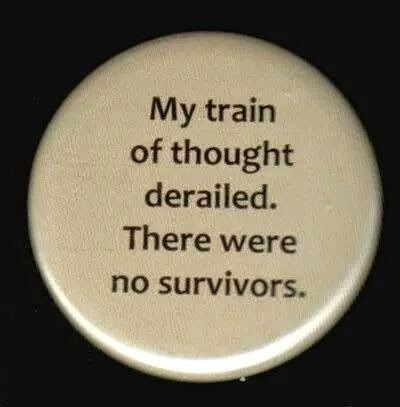 Tweeted since Facebook has me barred. That's a shame. I have well over 200 stuffed animals now. Some of them are huge! Didn't see the first Despicable Me but your review makes me want to! I didn't see the first Despicable Me but your review makes me want to rent it right away! Awww, I'm sure the Minions mean well, right? If more people did hold onto their inner child, the world would be a much better place, I think! You don't need to borrow a kid, Old Kitty--there were plenty of adults without kids in the theater when we were there! My kids loved the first one--and so did I! We'll see this one too;). Thanks for the great review!